Insignia Voice Smart Bluetooth Speaker & Alarm Clock w/ Google - Gray. With the touch of a few buttons, you're ready to enjoy multiroom music. 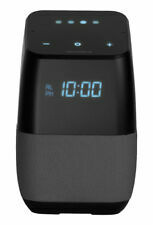 The speaker features a digital LED clock display and has a built in alarm clock. We utilize warehouses across the Continental United States. Once removed it will void your warranty. There is nothing broken or missing for this item. There are no sign of use. This item is 100% new condition. Color: Black. Insignia - Universal Rear Speakers (Pair) - Black - by Insignia. This Insignia rear speaker kit also has optical, RCA and 3.5mm jacks for connecting wired audio sources. It is 100% fully functional, in the manufacturer's box with OEM speakers (2), transmitter, Receiver, 10ft speaker wires (2), 5ft optical cable (2), 3.5mm to RCA adapter, Power adapters (2) and quick setup guide. Insignia Tabletop HD Radio Black NS-HDRAD2 SAFE PACKAGING! SEE PHOTOS! Included: RADIO AND WALL POWER CORD. 4.5 out of 5 stars - Insignia Tabletop HD Radio Black NS-HDRAD2 SAFE PACKAGING! SEE PHOTOS! 75 product ratings75 product ratings - Insignia Tabletop HD Radio Black NS-HDRAD2 SAFE PACKAGING! SEE PHOTOS! Fair: This device show moderate to major signs of use. There may be large scratches, dings, or scuffs on the unit, but they are still operable and ready for use. What's Included. Hear your TV audio better with this 2.0-channel Insignia Bluetooth sound bar. Its simple one-cable TV connection provides easy installation, and it has three preset sound modes for an optimal audio experience with movies, news and regular TV programs. Connect additional components to the USB and optical inputs of this Insignia Bluetooth sound bar. We will help to. resolve any issues quickly and fairly. Insignia Voice Smart Bluetooth Speaker with Google Assistant - Black.... Shipped with USPS Priority Mail. INSIGNIA (NS-SB216) 2.0 Channel Bluetooth Mini Soundbar. INCLUDES: SoundBar Remote Control AC/Adapter 3.5mm to RCA Adapter RCA Audio Cable Condition is Used. Shipped with USPS. Only at Best Buy Experience crystal clear sound for music and movies without the tangled wiring with this Insignia Bluetooth speaker system. This Insignia Bluetooth speaker system is compatible with enabled smartphones and tablets. The photos are taken on actual item on sale. B. Not Included: Nothing missing. 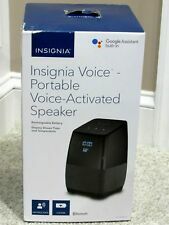 Insignia Voice Activated Bluetooth Speaker Google Assistant. These are open box returns and have not been tested. Shipped with USPS Priority Mail. We utilize warehouses across the Continental United States. Once removed it will void your warranty. All of our products will have a unique hollow-gram warranty sticker. Lot-50,57,58. resolve any issues quickly and fairly. This item is in excellent working order; however, it will show visible signs of handling such as scratches, scuffs or dents. Unopened, brand NEW! In addition to your TV you can connect your Phone via Bluetooth for great sound. 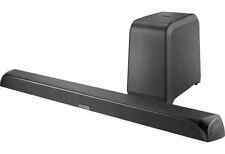 Insignia NS-SB515 2.1-Channel Soundbar with Wireless Subwoofer - Bluetooth - Home Theater. Condition is New. Shipped with USPS Parcel Select Ground. Universal compatibility with any Bluetooth enabled device. Good: This item has been used and shows evidence of wear and tear due to regular use. There may be mild scratches, dings or wear on the item. What's Included. Insignia NS-CSPGASP Bluetooth Speaker with Google Assistant - Gray. Shipped with USPS Priority Mail. Insignia 2.0 Channel BlueTooth Mini Soundbar NS-SB216. ONLY SOUND BAR! 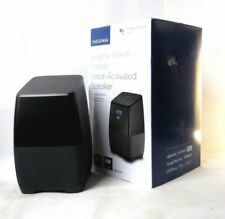 Insignia 2.0 Channel BlueTooth Mini Soundbar with Digital Amplifier. FULLY FUNCTIONAL. WITHOUT POWER ADAPTER AND OTHER ACCESSORIES. Sleek appearance Fits seamlessly along most HDTVs for a streamlined look. 4 out of 5 stars - Insignia 2.0 Channel BlueTooth Mini Soundbar NS-SB216. ONLY SOUND BAR! 139 product ratings139 product ratings - Insignia 2.0 Channel BlueTooth Mini Soundbar NS-SB216. ONLY SOUND BAR! Insignia- 2-Way Indoor/Outdoor Speakers Pair NS-OS112 Black Original Box. Condition is Used. In great shape - packed with original box, styrofoam and brackets. Two pairs available. Shipped with USPS Priority Mail. The item may be a factory second or a new, unused item with defects. Includes 1 RCA x 2 and 1 optical digital audio. Includes all accessories. Original box from manufacturer. Fits seamlessly along most HDTVs for a streamlined look. Insignia™ Voice™ Smart Portable Bluetooth Speaker and Alarm Clock with Google Assistant. With the touch of a few buttons, you're ready to enjoy multiroom music. It's your own digital assistant. Multiroom compatible portable speaker: Plays music in multiple rooms at once. Only at Best Buy Share your tunes at the beach or pool with this Insignia waterproof speaker. Built-in microphone. Pair this speaker with your smartphone, tablet or other Bluetooth-enabled device. Accepts hands-free calls through the speaker. Insignia NS-CSPGASP Bluetooth Speaker with Google Assistant - Gray. Condition is New. Shipped with USPS Priority Mail. With the touch of a few buttons, you're ready to enjoy multiroom music. It's your own digital assistant. Clock Display:The speaker features a digital LED clock display and has a built in alarm clock. KODAK LENS. CANON LENS. SAMSUNG LENS. NIKON LENS. CASIO LENS. Works Great! In Good Condition! It is Fully Functional.